A sailing ship has sailed out into the Kattegat. The windy weather fills its sails while the rocking waves crash against the ship’s hull. The island of Hjelm and the coast of Jutland can be made out on the horizon. C.W. 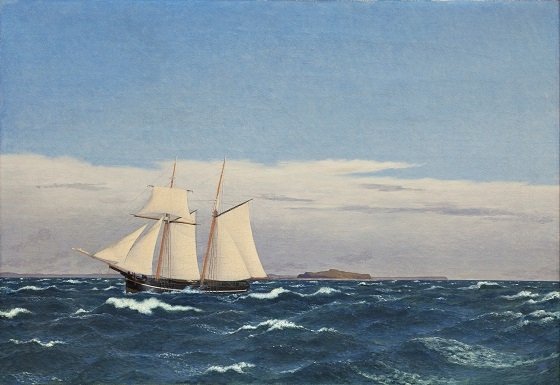 Eckersberg developed an interest in marine painting early on in his career. Already as a young artist, he completed a number of drawings of ships for commercial use, including etchings which were printed by the copperplate engraver Niels Truslew in 1805. These etchings allowed him to study ships at sea from different angles. The subject was therefore not a foreign one to Eckersberg when he later began work on larger marine paintings. In this work, he takes great care to capture the dynamic tension playing out between the waves and ship on a windy day in the Kattegat.